Be sure to check out our Custom Bitmap Symbol Tutorial Video to see how to use your own bitmaps. Be sure to check out our Videos page to see even more videos. I have a challenge. In my new organization, they use Real Time Enterprise instead of MS Project. The Task Order Schedule is at least 9k lines. I can export to Excel but I’m not sure how to build a Milestone chart with the key deployment tasks that we need to monitor. What would you suggest? That RTE file has UIDs so that’s good. But I’m spending way too much time comparing last week’s schedule to this weeks. How can I move a group of symbols about 4 months to the right all at the same time? I am using Milestones Professional to build a chart for our management. The task bars I am inserting (which should be solid) have a white stripe through the middle of them. Here’s a picture. Is there a way to increase the size of the tool box? it is too small to see what symbols I need to use. I’m using a very high res monitor. 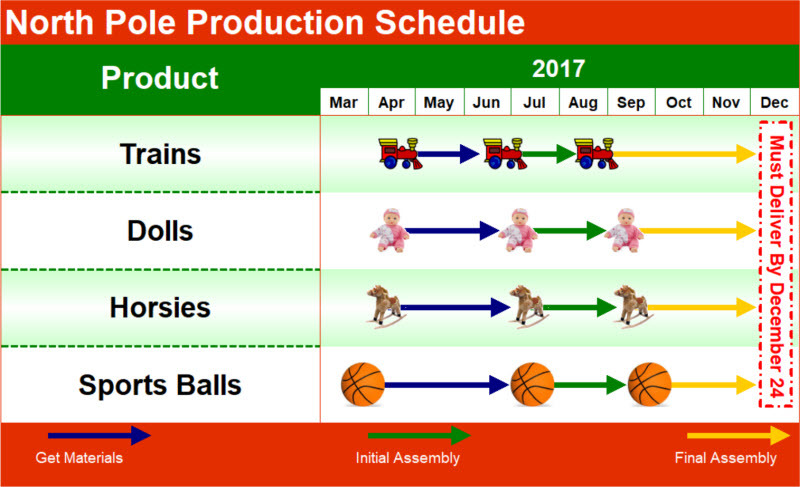 I am presenting my Milestones Professional schedule in PowerPoint and want to only show three rows on each PowerPoint slide. Any way to do this? How do I add a date and time stamp to show when the schedule was created (up in the right-hand corner of the schedule)? How can I place a date and time stamp in the lower left corner as a “footer”? What is the red line which zig zags down my schedule? What is the red line which seems to go in and out from the current date line?